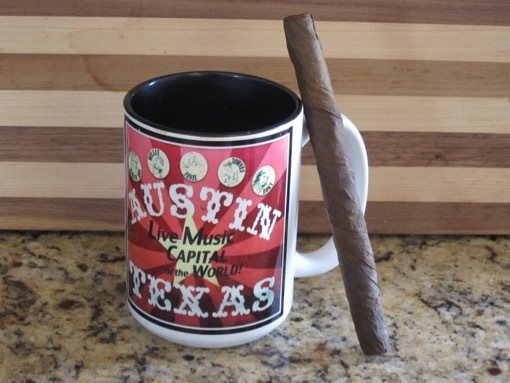 So here’s a cigar you’ll never smoke (since only one was ever made). One of the best parts of the many factory trips I’ve been on is experimenting with blends. Generally, a dozen or more types of tobacco are laid out. You pick out a combination and hopefully a skilled roller is there to turn your concept into a smokable fuma. It’s a humbling experience that gives you real appreciation for the difficulty of creating an enjoyable blend. A few months ago, I did this on a visit to General Cigar’s Dominican factory, which has some of the largest tobacco stocks in the world. One fuma I created used two types of rum barrel-aged tobacco (Dominican Piloto Cubano and Estelí ligero), which I combined with Seco (ASP and Estelí) and Viso tobaccos from Nicaragua. I had the blend draped in an Ecuadorian Sumatra wrapper. The some of the tobaccos from the rum barrels were a little too wet at the time, so I decided to wait to smoke it until now. I’m not going to say the experiment turned out amazing, but with a little sweetness and lots of wood spice, I actually would smoke this again. That’s the low bar against which I judge this experiment a success.